One of the things I regularly lament is the lack of permanence on the web. Especially when I had my design firm VFIVE, often our client work would be replaced or disappear in as little as 12 months after we completed it. 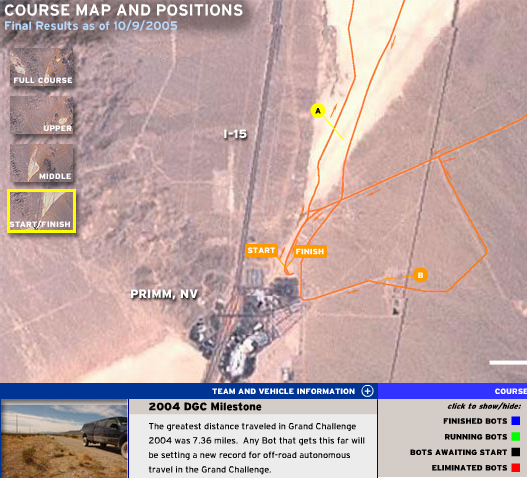 That’s why I was surprised to get an email this morning from my buddy Trevor Peace who found our project for the 2005 DARPA Grand Challenge not just online but actually still functioning! Fun to reminisce! We built a real-time Flash leaderboard that showed where the automated vehicles were on course from a GPS location feed. This was one of the few projects that I worked on that was an “event”. E.g., it wasn’t launched and then took on a life of its own. Instead, the shelf life for this was just a few weeks with a particularly important 36 hours during the race through the desert near Primm, Nevada. That kind of pressure brings new emphasis on testing. Especially when your customer is the Department of Defense! The lack of permanence on the web makes me envious of people who work with their hands for a living. I’m sure this is a “grass is greener” feeling but the kind of work where you physically create or sell something has a lot of appeal to me at this stage of my life. It’s also a lot easier to explain to your grandparents.